That refrain has been going through my head, in a different form, ever since President Trump signed the omnibus spending bill last week: Trump fought the swamp, and the swamp won. [Yesterday Trump gave] his approval to a bill that funds the parts of the budget included in annual appropriations. The overall increase is 12.9%. No wonder the Democrats are celebrating! President Trump said he had to sign the bill, and swallow some wasteful spending, in order to get a needed increase in the defense budget. But on a percentage basis, defense is up 14.2%, not much more than the overall average and less, ironically, than the budget for the State Department, and nowhere near as much as transportation and housing. So the swamp won. Some will say, of course, that Trump didn’t fight very hard. He says he won’t sign an unread omnibus bill in the future, which only makes one wonder why he signed this one. He also has called on Congress to give him line-item veto authority. Whether that can be done without running into a constitutional brick wall is doubtful. In the meantime, the trajectory of federal spending rises. We are still in the early days of Trump’s administration, but if history ultimately records it as a failure, his signing of the FY 2018 omnibus spending bill may well be seen as the turning point. And we haven’t even had a chance to grow tired of winning. PAUL ADDS: There was no attempt to “drain the swamp.” Trump’s only gesture of opposition to the omnibus was his expression of displeasure that it does nothing for the DACA population and doesn’t fund his over-hyped wall. 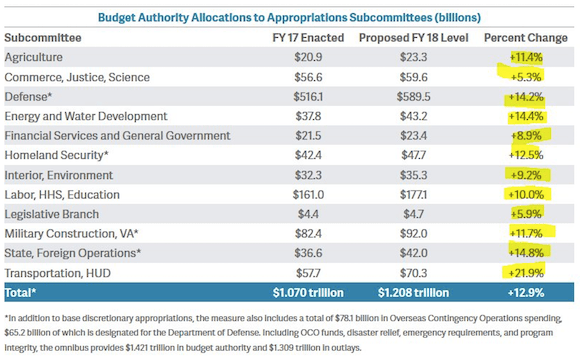 Even if Trump had gotten his way, the omnibus would still be a monstrosity. That’s the price of nominating a Republican presidential candidate who only knows a few catchy but not particularly salient lines of conservatism.